Naval Surface Fire Support: Navy's Near-Term Plan Is Not Based on Sufficient Analysis (Letter Report, 05/19/95, GAO/NSIAD-95-160). The Advanced Gun System (AGS) AGS is a 155mm Gun Weapon System planned for installation in the DD-21 Land-Attack Destroyers to provide high-volume, sustainable fires in support of amphibious operations and the joint land battle. AGS is a fully integrated gun weapon system that will include at least two separate gun systems for each DD-21 warship. Each gun system will be capable of independently firing up to 12 rounds per minute from an automated magazine storing as many as 750 rounds. The 155mm rounds are about 6.1 inches in diameter, versus the 127mm diameter of the standard 5-inch projectile. The AGS program also includes development of a 155mm version of the Extended-Range Guided Munitions (ERGM) as the first of a family of AGS munitions. AGS is being designed to meet the reduced manning and low radar-signature requirements of DD-21. AGS will employ 155mm caliber munitions capable of hitting targets accurately up to a distance of 100 nautical miles. One of the most amazing weapons of the First World War was the Kaiser Wilhelm Geschuetz, known to the Allies as the "Paris Gun". At a time when the best artillery of the day had a range of about 23 miles, it reached nearly 80. From March through August of 1918, three of the guns dropped 351 shells on Paris from the woods of Crepy, killing 256 and wounding 620 more. The Paris Gun's payload was only 15 pounds of explosive, accuracy was non-existent (it could hit Paris but not a specific target in Paris), and the barrels had to be rebored after 65 firings. The program started in FY 1999. The first gun system is scheduled for delivery to DD-21 in FY 2006, with an IOC of 2008. The AGS and its associated family of munitions are being developed under constrained affordability. The Developer/Manufacturer is United Defense Limited Partnership, Minneapolis, Minnesota, in partnership with the two DD-21 industry teams. United Defense began the design of the AGS in 1999 under a Section 845 Agreement with Bath Iron Works, the lead contractor for the DD 21 Shipbuilding Alliance. During 1999 United Defense conducted detailed analysis and trade studies for the AGS and recommended using a conventional single-barrel 155-mm Naval gun. With the acceptance of the Alliance and the Navy, United Defense began preliminary design of the AGS in November 2000. In the mid-1990s the Navy planned to address its surface fire support capability deficiencies in two phases, near- (scheduled completion by fiscal year 2001) and long-term (time frame to be defined). In the long-term phase, the Navy planned to develop a 155-millimeter vertical gun for advanced ships (VGAS) with an extended range guided munition. The Navy planned to equip the class of surface combatants, the DD-21 class, with the vertical guns beginning about the year 2008. The extended range guided munition technologies being developed within the near-term phase, along with the technologies being examined by several separately funded Advanced technology demonstration projects, were expected to be applicable in the long-term phase to develop other guided projectiles, including 155-millimeter and larger versions. The development of the conceptual 155 millimeter gun focused on both a pointing gun or a fixed, vertical gun [VGAS] -- the pointing gun was selected. The heart this gun will be an automated, ammunition magazine to reduce manning and increase the magazine capacity for rounds. With two VGAS guns on DD-21 it would be possible to carry as many as 1400-1500 rounds in a CESB module no bigger than the current VLS launcher. With fully automated magazines, Extended Range Guided Munitions (ERGM), and the equivalent of two USMC M198 155mm Howitzer Batteries in firepower, the two Advanced Gun Systems (AGS) in DD 21 will radically influence future naval gun developments. The vision for a littoral warfare strategy requires a system capable of providing effective and sustained Naval Surface Fire Support (NSFS) for amphibious operations and joint land battles. AGS will provide the needed accuracy, range, responsiveness, and volume of fire to fully meet the Navy's NSFS requirements. Associated with the gun are gunfire control functionality integrated into the DD 21 Total Ship Computing Environment (TSCE), an automated magazine, and low-radar and IR signatures for the gun and barrel. AGS design includes a family of 155mm extended range guided projectiles with warheads matched to the projected land attack target set. Efforts are underway to achieve as much commonality as possible with U.S. Army 155mm projectiles. Beyond its role on DD 21, AGS may someday serve as a model for future large caliber naval gun systems. Indeed, AGS requirements demand the most capable naval gun system ever produced, its extended range dwarfing the range of the 5"/54 Mark 4 mod 2 guns currently found on U.S. surface combatants. In addition, the expected projectile weight for the AGS munitions is much larger than that of current guns. Other revolutionary capabilities being developed in conjunction with AGS include state-of-the-art materials, and advanced barrel cooling methods. 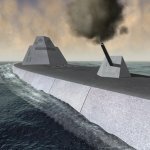 Finally, future lethality enhancements may include a penetrating capability that will certainly improve the warfighting capability of DD 21 and any other 21st century combatant.